It is difficult to speak precisely about collecting African art because much of what is called African art, does not fit into the canon of what is in the Western world considered to be art. This is not to dismiss African art on the grounds of quality: many very influential modern artists have been greatly influenced by African artefacts and curiosities, among them Picasso, Matisse and Modigliani. 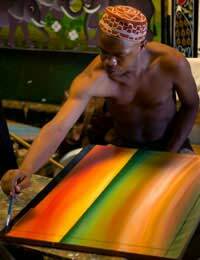 However, whereas Western art has struggled for centuries to shake off the influence of powerful religious and spiritual interests, African creative output is often motivated by their rich history of myth, legend and spiritual practice. This does not imply that there are no Africa artists and artists of African descent, but rather, simply that much of what passes for African art falls into the realm of artefact (much like the artefacts found in museums) or 'ornamental' (they are used to decorate homes with little concern for their real meaning or origins). This essentially amounts to three things; you could come a cropper in conversation over the arts if you do not understand the context of African art. You could also do injustice to these artefacts by not understanding their value as something quite different from Western art: African art often possesses a spiritual, ritual or social value that could not be attributed to artworks under a European definition. Finally, you could upset sensibilities for appearing to state that Africans do not and cannot make art - something which is clearly nonsense. In any case, you could come across as ignorant if the true context of what you possess in your collection is not appreciated, and if you are not aware of the debates surrounding African art in general. Unfortunately, this is the state of affairs in the art world, and perhaps an unnecessary one, given that essentially what you are after is something you like the look of and feel comfortable with in your art collecting. Ultimately, by all means buy African artworks that you like and call it 'African art', but beware that such a term is perhaps inadequate. As a term that indicates the origin of an 'artwork' however, it is sound enough, although, ultimately, rather vague. Other problems issue with the use of the term 'African art' purely because of the huge diversity in culture across the African continent. However, it is beginning to be acceptable to refer to artists that fall within the geographical boundaries of Africa as 'African artists'. This may, in fact, do something to cement togetherness across Africa's various communities. It is also becoming common to refer to people who descended from African slaves in the Americas, or peoples who left Africa for greater opportunities abroad, as African artists. This is an open acknowledgement of the suffering of displaced Africans and economic migrants. There are many reasons that someone would want to include African art in their art collecting: an affiliation with Africa, a deep interest in its history (either from an African or colonial perspective) or an aesthetic preference for African creative forms perhaps. Whatever the reason, African Art has a distinctive aesthetic and many people choose to specialise in collecting this creative form after their initial attraction to it. There are many sources from which to obtain African art, with plenty of galleries specialising in the work of Africans. Though this can be a lucrative art market, there is much for sale that really is not worth a great deal, and one must be careful not to pay over the odds for work that may be exploitative. There are plenty of opportunities for art dealers to charge high prices for attractive African craftsmanship, whilst the craftsman barely gets any reward. When buying African art, buy from a reputable dealer, and be sure to ask after the provenance of the artwork - even if the artist lives several thousand miles away it would at least be nice to know their name and a little about them. African art is enjoying increasing popularity and parity with the art and creative output of other continents with art biennales are regularly held in both Senegal and Johannesburg, although this is still a major under investment area for the arts. In your art collecting it may be well worth speculating on some bigger named African artists and hoping that the scene as a whole picks up beyond its popularity in providing household ornamentation. However, collecting African artworks is something that really must be done for the love of the objects themselves - clearly bigger non-European growth markets exist - India and China to name but two.